Happy Empowered Wednesday everyone! Each week, you know I always have the pleasure of talking with these amazing creators and get their advice and views on getting started, and what keeps them empowered and motivated to keep going! This author I've had the pleasure to become friends with (Who recently got married...your photos are #GOALS!) and even mentioned me at the back of a book which is super awesome, *Thank you again!! * and she also writes some amazing books that make you want to swoon and yell and just let all those feels out, even if you're on the bus with a bunch of strangers...So with that being said, let's get on with our latest Creator! A: I’m an author. 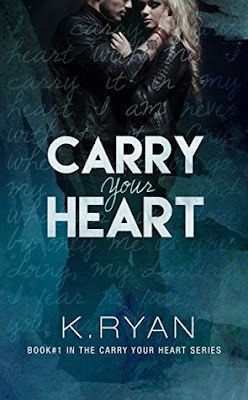 I’ve written four books - Carry Your Heart and it’s sequel, Carry You Home, Finding Emma, and All of the Lights. I’m working on my fifth book right now, which is taking longer than I’d like, but my real life, i.e. buying a house, wedding planning, and raising a puppy, has gotten in the way a little ;) I’m hoping that once my wedding and honeymoon are behind me, I’ll be able to dig in more and get that baby finished. A: I’ve been writing since I was probably 10 or 12. I’d get in trouble at school because I was writing short stories in my notebook instead of getting my homework done, so it’s something that’s just always been part of my life. I actually used to be a teacher, and writing was more of a pipe dream then - something I thought I’d maybe do one day, but didn’t quite know how to reach for it. Then self-publishing became a thing and my teaching position got eliminated, and then writing didn’t seem quite as high of a reach. I remember walking back to my classroom after just finding out I wouldn’t have a teaching job the next school very clearly. I was upset, sure, because it was a shock, but underneath that initial ‘what the hell do I do now,’ was just complete peace and excitement because I knew this was my chance. I went home that night and immediately started editing Carry Your Heart and have never looked back. A: My current book was really inspired by where I’m at in my life right now. I feel like I have two selves - the me that desperately wants to go back to the time when I was in college and everything was simple and is suffering from a case of arrested development and then there’s the me that accepts this adult life with these adult responsibilities because it means I have a future husband who is my rock, my love, and my best friend, a cat and a dog who are our world, a house (even if it comes with a mortgage), a car, a full-time job I actually enjoy and all the other ‘adult’ things I’m lucky enough to have. So I was thinking about that and basically created two central characters that represent each of those sides. How they’re at war with each other and how they have to make peace with each other. And romance, too, because how could it not have that? If I’ve learned anything through the process of writing four books, it’s that I’m at my best when I’m pulling from things that are deeply-rooted in my life. They say you should write what you know and I think that’s absolutely true. A: A quiet room with a view. Coffee. Lots of coffee. Wine. Lots of wine (depending on the time of day, of course). My playlists. My cat on my lap and my dog at my feet. A: I like to think I’m pretty good at writing characters who feel like they actually live and breathe. That’s really how I shape my writing style and the tone of each book. Each character needs to be a person who could exist outside of the book and behave the way someone would actually behave. After that, most of it takes care of itself because you have that solid foundation. A: My first year after teaching and first year as a published author, I was also working part-time. I knew I’d eventually find a full-time job, and I was sort of in a transitional period where I didn’t know what I wanted to do but knew I’d still need income outside of writing. When I was working part-time, I’d have these wonderful, massive blocks of time where I could just sit down and write. I don’t really have that right now in this season of my life and I’d give anything to have that back. So, I’d tell my past self to enjoy that time and be as productive as humanly possible. When I’m not writing, working, or planning my wedding, I really enjoy running. I just ran a 10K a few weeks ago and it was just as terrible/amazing as I knew it would be. My fiance and I also have really become homebodies since moving into our house and it is awesome. We really enjoy hanging out at home, grilling out, or watching movies together in our living room with our boys. I don’t care if it makes us losers at all. Also, we’re currently in the middle of about ten home improvement projects, so there’s that too. Q: How do you motivate yourself to keep the novel? A: I have a playlist on my phone for each book when I’m writing, so being able to listen to that when I’m running or in the car really helps me stay in that mode. It also helps me work out certain plot or character issues because the music helps me visualize what I’m trying to work through. A: There’s just not enough time in the day. It’s hard not to stretch yourself too thin and life sort of becomes this balancing act of, I have to cook dinner, fold laundry, run five miles, walk the dog, and write for at least an hour all from 5:30 to about 10:30 at night. It’s a little easier on the weekends, but even then, I still have to work really hard to manage my time so everything that needs to get done can get done. I’m really lucky that my fiance supports my writing and wants me to do it so he takes on some of those responsibilities so I can write, which obviously helps, but it’s hard not to get overwhelmed sometimes. A: Right now, I’m lucky if I get about an hour or two a day. I definitely have more time on the weekends, but in the summer, my writing time is a little lighter too. I know this sounds backwards, but I appreciate that I can really write just because I enjoy it. I don’t necessarily have to put any pressure on myself because it’s not my only ‘job’, if that makes sense. I don’t know if I would love it as much as I do if it became all I did because it would just be a job. A: I’ve loved Karina Halle for a long time - with her, I just really admire the way she’s carved a place out for herself in the publishing world and the social media world. I don’t always love everything she writes, but she’s certainly a model for all other aspiring authors to look up to and try to emulate. Lately, I’ve been following a few fashion/beauty bloggers who have been a terrible *Good* influence on me ;) If you don’t follow Lauren Kaye Sims, Lauren Bown, or Kate from the Small Things Blog, you really should - they’re real, they’re inspiring, and they’ll make your checking account disappear. You’re welcome and I’m sorry. A: My absolute favorite restaurant is Carmella’s in Appleton, Wisconsin (I live about ten minutes away from Appleton in the country) and their fettucine with parmesan cream is something I think/drool about all the time. From Starbucks, I really love the Skinny Vanilla Latte and any of their seasonal drinks during fall and Christmas time. A: From an emotional standpoint, my fiance, dog, and cat. If I’m being practical, a Harry Potter book hollowed out with iodine tablets, a first aid kit, and a NASA blanket (I’ve been watching The Office too much). A: Go for it! You’ll never regret it, no matter how it turns out. It’s easy to start, but hard to finish, so make sure you schedule yourself time to actually write. Also, spring for the book tours and professional book covers. Here's Where You Can Find K. Ryan!